Life Cycle Sustainability Assessment is a method to quantify the sustainability impact of a product over its entire life cycle. Life Cycle Sustainability Assessment is a method to report the sustainability performance. Section “Sustainability Assessment” starts with a short introduction to sustainability assessment. All life cycle methods described in this entry use a life cycle approach. Life cycle thinking forms the basis for this approach and is explained in the section “Life Cycle Thinking.” The LCSA method is derived from environmental life cycle assessment (LCA), a widely accepted and used environmental impact assessment method. The LCA method is described in detail in the section “Life Cycle Assessment.” The life cycle methods for the other sustainability dimensions economic impact and social impact are Life Cycle Costing (LCC) and Social Life Cycle Assessment (S-LCA). Both are described in the section “LCA-Derived Concepts for Economic and Social Assessment.” Section “Life Cycle Sustainability Assessment” provides an overview of the current state of LCSA and its potential future directions. This entry deals with the assessment of sustainability, also referred to as the quantification of sustainability impact. Sustainability relates to the balance between the impact of human activity on the Earth and the natural resources needed to support humanity. In 1972 at the UN Conference on the Human Environment held in Stockholm, the international community discussed the global human impact on the environment (United Nations Conference on the Human Environment Stockholm 1973). For the first time in history, it was acknowledged that economic growth could have ecological consequences beyond the carrying capacity of the planet. Consequently, global awareness was raised for the need to protect the natural environment. In 1987, the Brundtland Commission, formerly known as the World Commission on Environment and Development, was the first to describe sustainable development in their final report “Our common future.” The Brundtland Commission defined sustainable development as “development that meets the needs of the present without compromising the ability of future generations to meet their needs” (World Commission on Environment and Development 1987). The sustainable development definition was widely adopted and interpreted. “Our common future” puts emphasis on the protection of the natural environment as a requirement for economic growth and social well-being. It induced a shift in addressing sustainability as an environmental issue to a broader concept of sustainable development. The development of the “triple bottom line” sustainability concept (Elkington 1998) also plays an important role. The triple bottom line is an interpretation of sustainability and is also referred to as the three pillars of sustainability: the environmental, economic, and social pillar. It provides an operationalization of the broad sustainability development concept that can be applied to a product or a service. The triple bottom line approach integrally considers and balances economic, environmental, and social issues (Klöpffer 2008; Gimenez et al. 2012). Another well-known term is people, planet, and profit (triple P or PPP), where people is the social pillar, planet the environmental pillar, and profit the economic pillar. At the World Summit on Sustainable Development in Johannesburg in 2002, profit was modified to prosperity to emphasize that the economic pillar is much broader than company profit (Heijungs et al. 2010). The three bottom lines are independent, but also related to each other and partly in conflict with each other. A business is considered sustainable when it lives up to the “triple bottom line” of economic prosperity, environmental quality, and social justice (Elkington 1998). 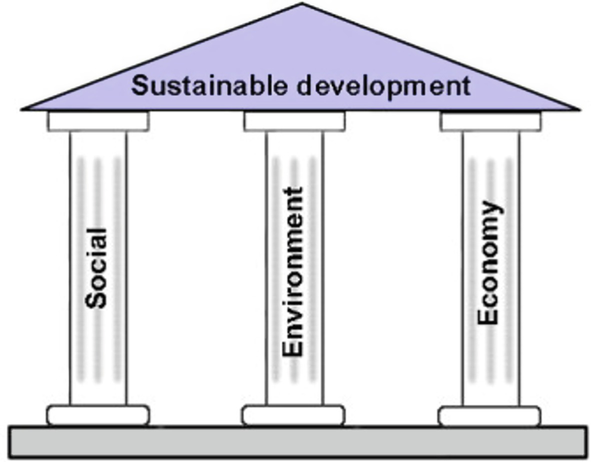 Sustainability is often represented as supported by three sustainability pillars (social, environmental, and economic), as depicted in Fig. 1. If one of the pillars is weak, then the system as a whole is unsustainable. It was concluded at the United Nations Conference of Environment and Development (UNCED) in Rio de Janeiro in 1992 that sustainable development is the most important challenge of humanity in the twenty-first century. If governments, businesses, and consumers would like to strive for sustainability, they need to know the economic, environmental, and social impact of their decisions (Klöpffer 2003). To this end, sustainability needs to be measured and compared, and this is not an easy task. Tools are required to inform the decision-makers on the consequences of their choices of materials, energy sources, production routes, and waste scenarios. The main challenge is to measure sustainability performance, especially for products and processes. Life Cycle Sustainability Assessment (LCSA) is a method to quantify sustainability impacts of goods and services (Klöpffer 2008; Heijungs et al. 2010). It is regarded an important instrument to support sustainable development. Life cycle thinking is an essential principle for sustainable development. Life cycles are common in nature. For example, the life cycle of a butterfly has four stages. First an egg is laid by a female butterfly, then the egg becomes a caterpillar, next the caterpillar makes a chrysalis, and finally the chrysalis turns into a butterfly (Matthews et al. 2015). For industrial processes, life cycles can be defined as well. The product life cycle includes the extraction of resources, manufacturing of products, product use, recycling of products, and waste disposal (Finnveden et al. 2009; Finkbeiner et al. 2010). In other words, the life cycle includes all stages from the product’s birth to its death. In LCA terminology, this is called the cradle-to-grave approach. The grave refers to the final stage of a product, such as landfill or incineration. As reuse of products and recycling of materials for new products become more prevalent, assessment of the full life cycle is sometimes also referred to as the cradle-to-cradle approach. There are also LCA studies that only assess the impacts from the resource extraction to the manufacturing stage in the factory, and this is called a cradle-to-gate approach, where the gate refers to the factory gate (Finnveden et al. 2009; Finkbeiner et al. 2010). Life cycle thinking means considering the impacts of a product beyond the focus of a company on the production site and manufacturing processes, thus including all processes that provide energy and materials to the factory and all stages of the product after manufacturing. This life cycle approach is essential to create a full picture of the environmental impact related to a product. Such full picture avoids reducing the environmental impact at one point in the life cycle while increasing it at another point. It also avoids improving the environmental impact in one stage at the expense of the impacts in another stage (Klöpffer 2003; Finnveden et al. 2009; Finkbeiner et al. 2010). As made explicit in the term Life Cycle Assessment, LCA studies consider the entire life cycle of a product. It is a structured method to quantify all relevant substances emitted and resources consumed and the associated environmental impacts (International Organization for Standardization (ISO) 2006a). The first life cycle assessments were performed around 1970, although they were not called LCA at this time. The first oil crisis and the awareness of the impact of economic growth on the environment induced the development of methodologies to assess environmental consequences of energy use, use of resources, and waste generation. The current LCA method was developed by the Society of Environmental Toxicology and Chemistry (SETAC) in a series of workshops to standardize the conduction of LCA. It resulted in the first guidelines for LCA in 1993 (Klöpffer 2003). In the next years, LCA was standardized by the International Organization for Standardization. At present, the LCA framework is internationally standardized in two ISO norms 14040 and 14044 (International Organization for Standardization (ISO) 2006a, b). ISO 14040 describes the principles and framework, while ISO 14044 provides the requirements and guidelines. Standardization is necessary to provide an agreed set of requirements and guidelines to perform a LCA study. Without such requirements and guidelines, it would be up to the person performing the LCA to make individual choices, and this would lead to incomparable results. The use of the standard safeguards a unified approach and fulfillment of the minimum requirements for a LCA study (Klöpffer 2003; Joint Research Center – European Commission – Institute for Environment and Sustainability 2010). LCA can be used as a decision-making tool that quantifies the environmental impact of all inputs and outputs of a product. The term product is used for both goods and services (International Organization for Standardization (ISO) 2006a). The LCA method also allows for comparing environmental impacts between products. The goal and scope of the study are defined in the first phase. The reasons for carrying out the study, the intended application of the LCA, and the target audience are documented. Applications of an LCA are, for example, strategic planning purposes, product marketing, or product development. The first phase is also the phase in which the system boundaries are set to make clear what is included in the study and what is excluded. Finally, the functional unit is defined (International Organization for Standardization (ISO) 2006a). It provides the function that the product has to fulfill. By defining the function, it is not predefined which product will provide the function, and it allows making fair comparisons between different products that could serve the same functional unit. A comparison between two materials can only be performed by comparing two products in which the materials are used (Joint Research Center – European Commission – Institute for Environment and Sustainability 2010). The quantification of the functional unit is necessary to enable calculation of the inputs and outputs of the systems that are needed to perform the function of the functional unit. The following example will show that designing a proper functional unit is crucial for a study and the conclusions that can be drawn from it. Suppose that a study would like to compare the environmental impact of refillable bottles of material A and one-way beverage cartons of material B as a container of beverage X. If the functional unit would be defined as one beverage container, this would lead to misleading results. The study would not take into account that a percentage of the refillable bottle is returned and reused as beverage container, while the one-way beverage cartons can only be used once. For the modelling of the recycling, activities like transport and cleaning of the bottles need to be included in the study as well. Suppose it is determined that on average the refillable bottle is returned and reused to give a total of 25 uses per bottle. A better functional unit for this comparison would be the packaging of 1000 liters of beverage X. With this functional unit, the comparison would be between 1000 beverage cartons and 40 bottles (Joint Research Center – European Commission – Institute for Environment and Sustainability 2010). The second phase is the life cycle inventory (LCI), and it is generally the most time-consuming part of the LCA study as it concerns the data collection. All processes within the system boundaries are identified and quantified in terms of inputs and outputs. The LCI is a collection of all inputs and outputs including all material flows and energy flows from the product over the life cycle, all in relation to the defined functional unit. Inputs relate to consumption of resources: energy resources, mineral resources, and renewable resources. Outputs relate to emissions of substances from the product system to air, to water, and to soil. An LCI can be complex and may include a variety of processes with a great number of different substances. The final result is a compilation of all inputs and outputs (Finnveden et al. 2009; Joint Research Center – European Commission – Institute for Environment and Sustainability 2010). In many processes, a product is generated together with coproducts. In such situations, allocation of environmental impacts to the different products is required, since all products jointly generate the impact. ISO 14040 suggests avoiding allocation by decomposing the processes in subprocesses for individual products or by system expansion (International Organization for Standardization (ISO) 2006a). In system expansion coproducts are seen as alternatives to other products on the market. The impact of the displaced products in the market is subtracted from the impact of the system under study. This leads to a net environmental impact for the main product. If avoidance is not possible, allocation of environmental impacts has to be performed. Allocation can be performed based on the relative masses of the product and coproducts or can be based on the economic values of the product and coproducts. With economic allocation, the product with the highest economic value carries the highest environmental impact share. Allocation is one of the most controversial topics in LCA (Joint Research Center – European Commission – Institute for Environment and Sustainability 2010). An LCI consists of many data, and it can be a great effort to collect all appropriate data for the study. To facilitate LCI and to avoid repetition of the same data collection, databases have been set up the past decades. There are public databases, industry databases, and databases compiled and offered by consultants (Finnveden et al. 2009). Most databases contain average data representing average production and supply of goods and services. Quality and consistency are important for the quality of the LCA study. To promote high-quality datasets worldwide, the European Life Cycle Data Network was launched in 2014 to provide a globally usable infrastructure for the publication of quality-assured LCA datasets (Joint Research Center – European Commission). The third phase is the actual life cycle impact assessment (LCIA) in which the LCI is connected to environmental impacts. For all inputs and outputs, the environmental effects are collected and classified into impact categories (International Organization for Standardization (ISO) 2006a). For example, all components that cause global warming are reported under the Global Warming Potential impact category in the LCIA, even if different substances from different processes of the LCI are responsible for the effect. For example, CO2 (carbon dioxide) and CH4 (methane) are both greenhouse gases contributing to global warming and are reported under one impact category Global Warming Potential. The impact is reported in one unit. Since different substances may have stronger or weaker environmental effects, one substance is chosen as a reference. For example, Global Warming Potential is expressed in CO2 equivalents. This means that for substances other than CO2, the effect is expressed relative to the reference of CO2 (Jolliet et al. 2003; Joint Research Center – European Commission – Institute for Environment and Sustainability 2010). There are several methods for classifying and characterizing the impact of the processes of the system under study on the environment. The category indicator relates an LCI result to an environmental effect. If the effect takes place relatively shortly after a substance is present, it is called a midpoint indicator. 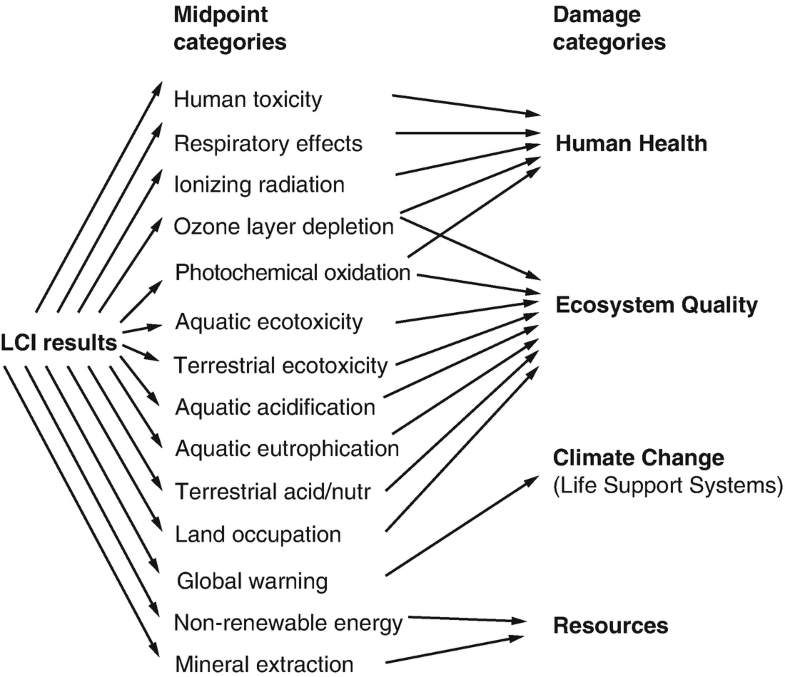 Examples of midpoint indicators are global warming, stratospheric ozone depletion, acidification, photochemical ozone creation, eutrophication, human toxicity, and aquatic toxicity. If the effect that is measured is damage-oriented, then the category indicator is called an endpoint indicator. Examples of endpoint indicators are human health, ecosystem quality, climate change, and resources (Joint Research Center – European Commission – Institute for Environment and Sustainability 2010). 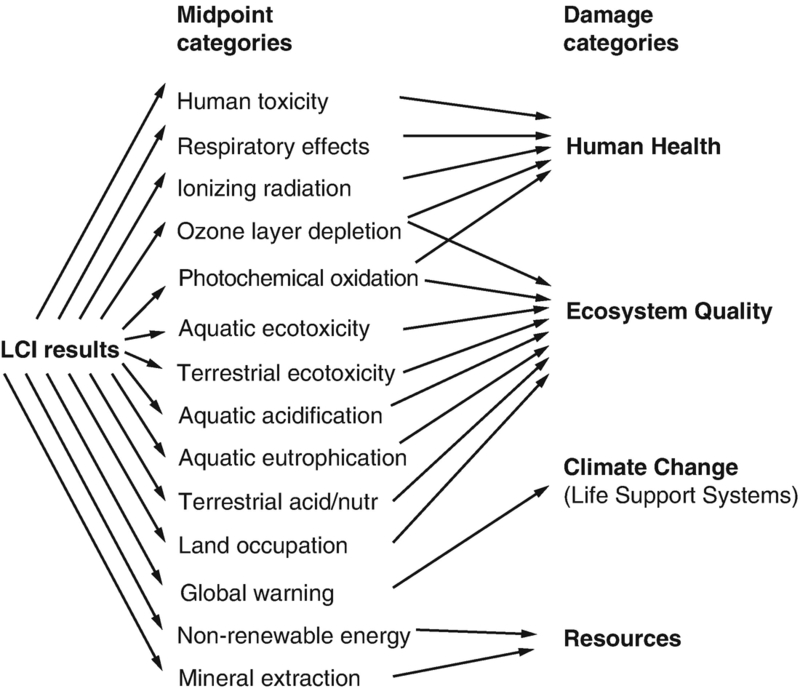 LCA studies make use of different selections of environmental impact categories, and some use midpoint indicators, while others prefer endpoint indicators. The IMPACT 2002+ LCIA method is a combined midpoint and damage approach in which all LCI results are linked via 14 midpoint indicators to 4 damage categories. The IMPACT 2002+ LCIA method is shown in Fig. 3 (Jolliet et al. 2003). In the last phase, life cycle interpretation, the results from the first three phases are evaluated in relation to the goal and scope with the aim to reach conclusions and recommendations (International Organization for Standardization (ISO) 2006a). The interpretation phase has three steps. The first step is identifying the “significant issues.” Significant issues are the main contributors to the environmental impacts as found in the LCIA phase as well as the choices made in the study that may affect the accuracy of the LCA results. The second step involves evaluation of the significant issues to study their sensitivity or influence on the LCA results. If a study is very sensitive to a choice made in the study, it is worth investigating how it is influencing the LCA result and what it means for the conclusions that can be drawn from the study. The last step is to formulate the conclusions and recommendations of the study. In the case that a comparative LCA study is made public, a critical review is mandatory according to the ISO 14040 and ISO 14044 standards (International Organization for Standardization (ISO) 2006a, b). At least three independent experts need to review the study, and the reviews are included in the report of the LCA results. The execution of an LCA study is usually an iterative process. After definition of the goal and scope of the work, the LCA practitioner performs the next steps of LCI, impact assessment, and interpretation. In these phases, information is gathered, and it can become clear that the goal and scope have to be adjusted due to lack of data or insufficient representative data due to geographical or temporal mismatches. The impact assessment and the interpretation phase can lead to the identification of critical issues that largely influence the end result and need to be resolved, or the conclusions of the study have to be changed. Therefore, LCA phases are not subsequent steps, but interrelated activities that influence each other. During this process, the goal and scope may need to be improved or even changed until sufficient accuracy and completeness of the results have been achieved. Since the wide use and standardization of environmental impact assessment with LCA, two derived methodologies for the other two sustainability pillars have emerged: Life Cycle Costing (LCC) for economic impact assessment and Social LCA (S-LCA) for social impact assessment (Klöpffer 2008). Both life cycle methods are described in the next two sections. There are several approaches for the assessment of the economic dimension of sustainability. Life Cycle Costing (LCC) relates to the life cycle cost of a product, which are the total costs of a system or product that are directly covered by one of the actors in the product life cycle over a specified lifetime. For producers and consumers, it can be attractive to not only get information on the environmental impact of a product but also on the cost over the full life cycle. Possibly higher costs are associated with purchasing environmental friendly products, but if such product saves money over the lifetime, it can be cheaper if the use and end-of-life of the product are taken into account (Klöpffer 2003). One example is the purchase of insulation for a new building. LCC can be used to assess whether this environmental improvement of the building is profitable. The extra costs for insulation are counterbalanced by energy cost savings during the use phase of the building. LCC can inform the decision-maker on the net cost effect over the entire life cycle. LCC is the oldest of the three life cycle techniques. It was developed from a financial cost accounting perspective. If the assessment is limited to actual cost, one can refer to it as LCC in a narrow sense or conventional LCC (Finkbeiner et al. 2010; United Nations Environment Programme (UNEP) 2011; Swarr et al. 2011). Usually LCC takes into account investment costs, costs for operation and maintenance, and end-of-life disposal costs. Larger scopes in LCC studies are also used by including costs that are more indirectly related to the product, like external cost or social cost. For example, including external cost means that a tax on emissions or subsidies for staff members that are reintegrating in the labor market are taken into account as cost and benefit, respectively. Costs must relate to real cash flows to prevent overlap between environmental LCA and LCC (Klöpffer 2003; Rebitzer and Hunkeler 2003). Societal LCC has a broader scope than LCC. It includes all private and external costs and benefits related to a product. It includes costs that are not incurred by the company of a product, but by society as a result of the product’s life cycle (United Nations Environment Programme (UNEP) 2011; Klöpffer and Ciroth 2011; Schau et al. 2011). The quantification of societal cost is not straightforward. Information is needed on all effects (damages) related to the life cycle of the product in society that cost money within a certain time frame. In addition, not all societal effects can be expressed in money, so they cannot be included. Since different scopes are possible, the LCC study must define what type of costs are included. LCC within the LCSA context is defined as an assessment of all costs associated with the life cycle of a product irrespective of who covers those costs, including environmental externalities in so far their economic value can be determined. Environmental externality costs are, for instance, the costs of emissions of greenhouse gases or costs associated with emissions of other pollutants. This type of LCC is also referred to as environmental LCC (Klöpffer 2003; Rebitzer and Hunkeler 2003; United Nations Environment Programme (UNEP) 2011; Swarr et al. 2011; Schau et al. 2011). The three scopes of LCC application are schematically represented in Fig. 4. Although LCC is older than LCA, it is not standardized in a norm. In 2011, guidelines were published defining the LCC method and a code of practice (United Nations Environment Programme (UNEP) 2011; Swarr et al. 2011). An LCC study is usually executed following the LCA standard ISO 14040 (International Organization for Standardization (ISO) 2006a, b) with some specifics for economic assessment. As in LCA, the first phase concerns the definition of the goal of the study, the functional unit, and the system boundaries. The second phase is the LCI in which the costs for each process are inventoried and categorized. The data will generally be retrieved from several different sources, and developing a coherent dataset can be tough. Costs data may be available in different currencies and may also be related to different time periods. In addition, cost databases are not separately available and not included in LCA databases. As in LCA, allocation of costs to particular subjects is not trivial. It must also be decided which costs to include in the assessment. For example, costs for the consumer are revenues for the manufacturer and include a margin on the production costs. It depends on the perspective of the assessment what is included. If the perspective is the consumer, all costs from other actors are considered a black box, and no differentiation of these costs is needed. The diversity of possible perspectives for LCC leads to a large number of different LCC approaches (Rebitzer and Hunkeler 2003; Finkbeiner et al. 2010). Another important aspect that is specific for LCC is the discount rate. When costs have to be analyzed over a longer period, it has to be taken into account that the value of the money decreases over time. Hence, discounting refers to the procedure to convert costs and benefits at different points in time to a single monetary unit that is compensated for the value change in time (Ozbay and Jawad 2006). The third phase of impact assessment is not needed in LCC, since the LCI contains only one unit of impact, the selected currency for the study. The interpretation of results is the final phase and comparable to LCA. Data are interpreted and conclusions and recommendations put forward. A review can be performed, but this is not a common practice yet (Klöpffer 2008; United Nations Environment Programme (UNEP) 2011; Swarr et al. 2011). Social LCA (S-LCA), the social impact assessment analogue of LCA, is a life cycle assessment method that is still in an early stage of development (Klöpffer 2008; Zamagni 2012). Social Life Cycle Assessment reports positive and negative social impacts over the life cycle of a product, where social impacts are consequences of social relations or social interactions in the context of the product’s life cycle (United Nations Environment Programme (UNEP) 2009). Social impacts can be the result of specific behaviors, for example, a decision on working hours of employees, and of socioeconomic decisions, for example, investment decisions, and can be effected by the local resources, for example, the overall health condition of the employees. S-LCA can be used to increase the knowledge of social impacts of product choices and to promote the improvement of social effects of products. However, it is more difficult to distinguish positive and negative impacts, as it may be less clear for social effects what is desirable or not (Benoît et al. 2010; Jørgensen 2013). Moreover, shifting of social impacts may also occur, as is also known in LCA. If an industry is shifting its activities away from an area where child labor is usual, it can improve the social impact of the product, since child labor is avoided. However, when many people in the region rely for their income on their children in this industry, it will lead to poverty, another undesirable social effect (Jørgensen 2013). The interest for S-LCA is growing, also related to the further development of LCSA, as LCSA aims to address all three sustainability pillars. In 2004, the UNEP/SETAC life cycle initiative identified a need for integrating social aspects into LCA (Benoît et al. 2010). As for LCC, S-LCA guidelines have been developed and published in 2009 (United Nations Environment Programme (UNEP) 2009). The S-LCA method is similar to LCA and follows the structure of the ISO framework (International Standard Organisation (ISO) 2006a, b): goal and scope definition, life cycle inventory, impact assessment, and life cycle interpretation, with some specifics for social assessment. While LCA mainly focuses on information on objective physical quantities related to the product cycle, S-LCA is related to information of stakeholders on societal impacts, and it may be subjective information. For example, information provided by employees on working circumstances is inherently subjective. In these cases, more objective data like physical measurements of working circumstances like temperature and air quality would introduce greater (instead of less) uncertainty in the social impact assessment and are thus less favorable for S-LCA. Since impacts vary greatly between different geographic locations, local data are desirable (United Nations Environment Programme (UNEP) 2009; Benoît et al. 2010). A specific characteristic of S-LCA is that the inventory data and impact assessment are specified in relation to different stakeholders. The five main stakeholder categories are workers/employees, the local community, society (national and global), consumers (end-consumers and all consumers in the supply chain), and value chain actors (including suppliers). In addition, there are impact categories on social themes, like human rights, health and safety, cultural heritage, and poverty, with indicators per impact category. 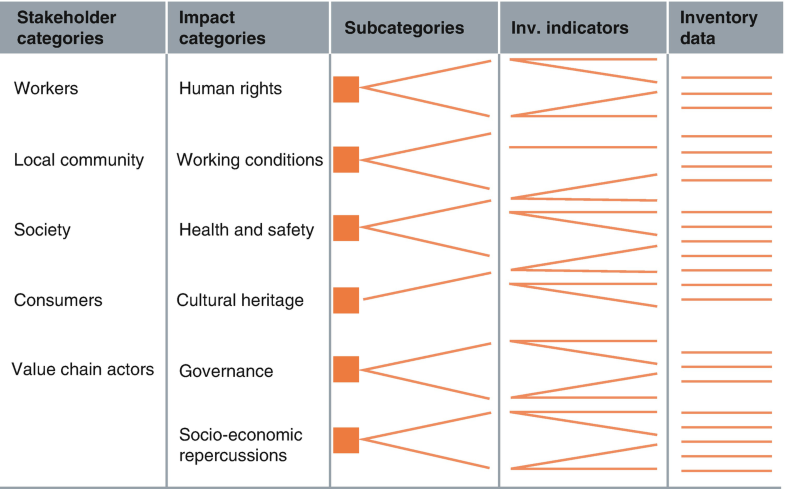 An overview of stakeholder and social impact categories is shown in Fig. 5. Since some impacts are best illustrated by qualitative indicators, the inventory will include quantitative as well as qualitative data. The data collection is performed by web search, literature review, and use of UN or OECD databases, while site-specific data collection can be performed by reviewing the company information (e.g., payrolls, management information), by reviewing documents of NGOs and authorities, by interviews, as well as by questionnaires and surveys. There is currently no universal set of impact categories, but a minimum requirement is needed to avoid the use of S-LCA on some selected topics for social marketing purposes instead of using it for an assessment addressing the most important social impacts (United Nations Environment Programme (UNEP) 2009). A study on sustainability indicators for social impact assessment identified over 150 proposals for different social objectives and indicators, demonstrating the challenge to standardize S-LCA as well as the diversity of the social sustainability pillar (Finkbeiner et al. 2010). S-LCA is most useful in providing insight in the advantages and disadvantages between different alternatives. Probably none of the alternatives has all the advantages, but S-LCA will highlight under what circumstances one alternative is preferred over the other, as S-LCA will provide a better understanding of the system, its complexity, and the associated impacts. This will allow decision-makers to make decisions with the best available information on the social consequences (United Nations Environment Programme (UNEP) 2009; Benoît et al. 2010). Since the definition for sustainability by the Brundtland Commission, there has been a desire to develop a suitable method to assess sustainability across the three sustainability pillars: environmental, economic, and social (World Commission on Environment and Development 1987). In 2000, the Natural Step sustainability theory was presented as a framework for guiding progress to sustainability (Upham 2000). It emphasized the need for a sustainability framework broader than (environmental) LCA. In 2005, it was proposed to extend the environmental life cycle setting to economic and social aspects to address the three pillars of sustainability (Hunkeler and Rebitzer 2005). 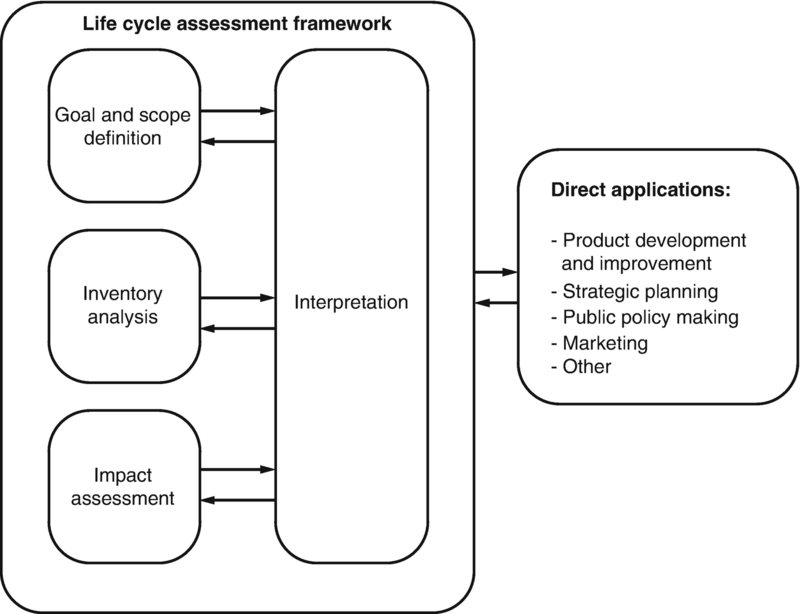 As (environmental) LCA, LCC, and S-LCA are all based on the ISO 14040 framework and address the three sustainability dimensions (environmental, economic, and social), the three life cycle assessment methodologies can be combined in one Life Cycle Sustainability Assessment (LCSA) framework. In 2008, the framework was formalized into the LCSA framework (Klöpffer 2008). With these developments, LCA expanded from only environmental assessment to a more complete sustainability assessment method. According to Klöpffer, LCSA can be approached in two different ways (Klöpffer 2008). The first approach consists of three separate life cycle assessments (LCA, LCC, and S-LCA) with coherent and preferably identical system boundaries. The combination is expressed as LCSA = LCA + LCC + S-LCA. LCSA will include three impact assessments in three sustainability pillars. Such LCSA can be performed with the current independently used methods for LCA, LCC, and S-LCA in a combined way (Klöpffer 2008; United Nations Environment Programme (UNEP) 2011). 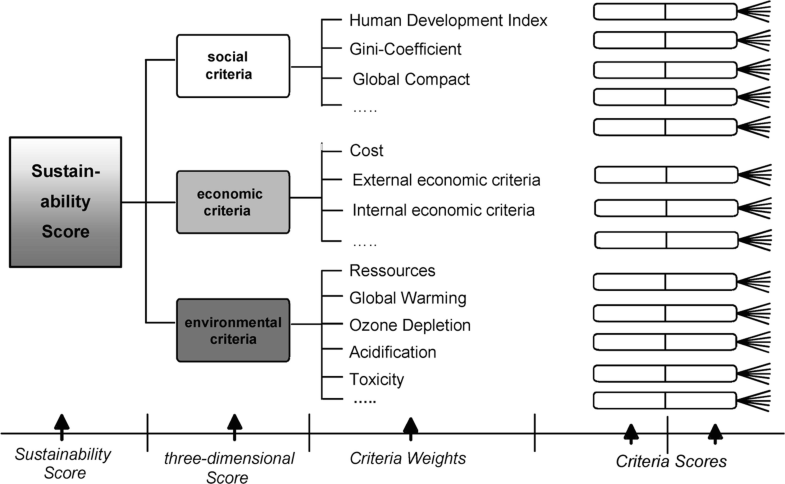 Figure 6 shows an LCSA evaluation scheme addressing all three sustainability pillars with the possibility to weigh different criteria to get a sustainability score (Finkbeiner et al. 2010). However, no weighting has to be performed between the three sustainability pillars with the advantage of transparency, since no trade-offs between sustainability pillars have to be made. To improve the LCSA method, it would be favorable if LCC and especially S-LCA would be further developed, and it is highly recommended to standardize all three methods (Zamagni 2012). Another point of attention is that LCSA results are difficult to understand and to interpret for a non-expert audience (Finkbeiner et al. 2010). The second approach for LCSA consists of a single assessment method for sustainability. It would be LCSA as a new form of LCA with a broader sustainability scope instead of the traditional environmental scope. This LCSA needs only one integrated inventory. One LCI for three sustainability dimensions can be very challenging, especially since the S-LCA will require more regional data than LCA and LCC and will also include qualitative data. Moreover, integration requires decisions or trade-offs between the different sustainability pillars that need to be carefully addressed (Klöpffer 2008; Finkbeiner et al. 2010). In addition, mutual relations between the three sustainability dimensions should be considered in an integrated approach. The joint impacts of LCA, LCC, and S-LCA are probably more than the sum of the impacts of the individual assessments because of synergistic effects (Lee and Kirkpatrick 2001; Zamagni 2012). The integrated form of LCSA is characterized by Guinée et al. as a transdisciplinary integration framework of selected and interlinked methods to answer life cycle sustainability questions rather than a method on its own (Heijungs et al. 2010; Guinée et al. 2011). It was also proposed to include additional methods to the three life cycle approaches. Halog and Manik combined stakeholders analysis supported by multi-criteria decision analysis and dynamic system modelling with LCA, LCC, and S-LCA for LCSA (Halog and Manik 2011). Within a case study on electricity generation in Mexico, a sustainability framework was presented comprising scenario analysis and multi-criteria decision analysis in combination with LCA, LCC, and S-LCA (Santoyo-Castelazo and Azapagic 2014). It can be concluded that LCSA is yet at an early stage of development and the framework needs to be further developed and operationalized with case studies and new methodological approaches. This brings a scientific challenge that requires further research on numerous issues. International collaboration would avoid the development of various separate approaches and methods (Guinée et al. 2011; Zamagni 2012). The challenge will be to develop guidelines and LCSA handbooks followed by an ISO norm on LCSA. This would open up a new era for sustainability assessment.